Sometimes, the one thing that keeps us off of our bike is the one this that should be making us get on it: stress. Stress is a major buzz word, so much so that it has become almost meaningless. We all use it and we all feel it, especially when economically tough times are upon us and especially during busy times. Unfortunately, sometimes, when we are too busy and feeling stressed, the most important stress buster that we have in our anti-stress arsenal are eliminated: exercise. We all know that too much stress is deadly. Stress contributes to high-blood pressure, heart disease, poor habits and a lowered immunity. The truth is that making time to ride your bike during stressful and busy times isn't just important for your physical health, but your mental health as well. Recent studies have shown that exercise can be as useful to combating stress and depression as medial intervention. Study after study has show that working out helps reduce the negative health effects of stress. When we exercise, we put our body under stress. However, unlike the sedentary stress that we feel when we are sitting at our desks, when we exercise we actually condition our bodies to deal with stress in the way that it was meant to deal with it. Bodies were designed to get up and get going when life was stressful. Exercising helps relieve our body of the stress hormones and produce feel good hormones. There is also good evidence that physically fit people have less extreme physiological responses when under pressure than those who are not. This means that fit people are more able to handle the long-term effects of stress, without suffering ill health or burnout. 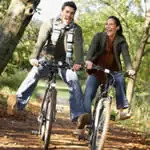 In many ways cycling may be better than some other forms of exercise in relieving stress. Cycling as meditation: The repetitive action of pedaling involved in cycling can help your brain release outside stresses in the same way that mediating on a phrase or a word is used in classical mediation. By focusing on your pedal stoke you can block out other worries and stresses of the day, giving your brain a break from all of your daily problems. Getting out into nature: Granted, commuting to work through busy intersections and battling traffic or trying to keep up with a cycling pack without getting dropped is anything but stress reducing. But when you find a peaceful hill to climb, or even when cycling through a quiet neighborhood, you have the opportunity to be out in nature. Being exposed to the natural elements of cold or heat and feeling the wind is another way to release the stressful thoughts and focus on things outside of ourselves. Getting better at anything increases confidence and can be a great mood lifter: Moving up in the pack, making it over a particularly tough climb or completing your first century are all great stress reducers because they allow you to feel that you have accomplished something. So much of our lives are simply repetitive tasks or tasks where we feel that that we have limited control over our own success. But when it comes to your bike you are in control. You know that if you work hard you will get better. More enjoyment equals less stress: Whether you are the type of rider who likes to spend hours riding alone, you love to meet all of the guys for the big, early morning ride at the local coffee house or you like training for a competition, riding is more than exercise, it is fun. Unlike doing countless reps on a weigh machine or spending hours on an elliptical training in the gym, cycling is fun. It reminds of us being a kid when we rode our bike to get out of doing homework or on our way to a big adventure. So don't let stress keep you from riding, let it motivate you to ride. Road Bike Action is an enthusiast magazine focusing on new products, bikes, training and the transformative culture of bicycles. Check us out at www.roadbikeaction.com.